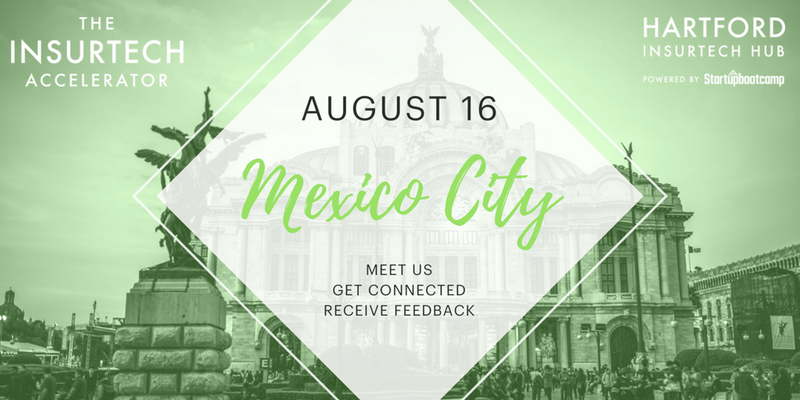 On the 16th of August, The InsurTech Accelerator, part of Hartford InsurTech Hub powered by Startupbootcamp welcomes you to Mexico City for Office Hours as part of our international tour to find the best rising insurtech companies. The event is also a great opportunity to receive an invitation to our Selection Days, and potentially become one of the ten teams to enter our 2019 programs. Mentorship is one of the best ways to engage with innovative new insurtech startups. Mentors provide startups with real, life-learned advice, and inspire startups to look at problems and challenges from a different perspective. If you are one of Hartford Insurtech Hub’s or Startupbootcamp InsurTech’s experts, we encourage you to attend this Office Hours to speak to startups one-on-one and provide valuable mentorship. If you are a US-based startup or can easily reach Mexico City to meet our team, we encourage you to apply. We are looking for startups that improve upon these lines: Personal, Comercial & Speciality lines, as well as Life, Annuities and Retirement. If your team is planning to fly in to attend the Office Hours session, you can request an early evaluation to better accommodate your travel schedule. If you have any questions about the Hartford InsurTech Hub Office Hours, please email us at hello@hartfordinsurtechhub.com.